For nearly three decades we have been undertaking pioneering scientific research that has changed the face of healthcare the world over. In fact, our work has saved lives, improved treatment, speeded up recovery times, influenced healthcare policy and changed laws. Advanced the management and prevention of pressure sores in hospitals by developing mattress testing technology which has been adopted as an International Standard testing method. Improved surgical outcomes for children with cleft lip and palate by developing the use of 3D laser scanning to analyse facial features and facilitate more accurate planning of operations. Developed surgical techniques which have enhanced the lives of patients suffering from facial palsy. Provided evidence that birth trauma is not the primary cause of permanent congenital facial palsy, and that brain structure is a more common cause than was previously thought. Published research on Dupytrens contracture (a condition which causes one or more fingers to bend into the palm of the hand) which helped to promote less aggressive surgical techniques and resulted in better patient outcomes. Published research findings which were recognised by the Pharmaceutical industry as being significant for the future of cancer treatments. RAFT researchers demonstrated that using antisense to block the expression of the c-myc gene can improve chemotherapy results for patients. Demonstrated that certain forms of Basal Cell Carcinoma; a type of skin cancer, can be removed effectively using a vaporisation laser- a quicker and easier method than surgery. Identified early signs of life threatening toxic shock syndrome in children who have suffered burns. These early signs, which should trigger vital pre-onset treatment of the condition, have since been sited in recommendations to clinicians. 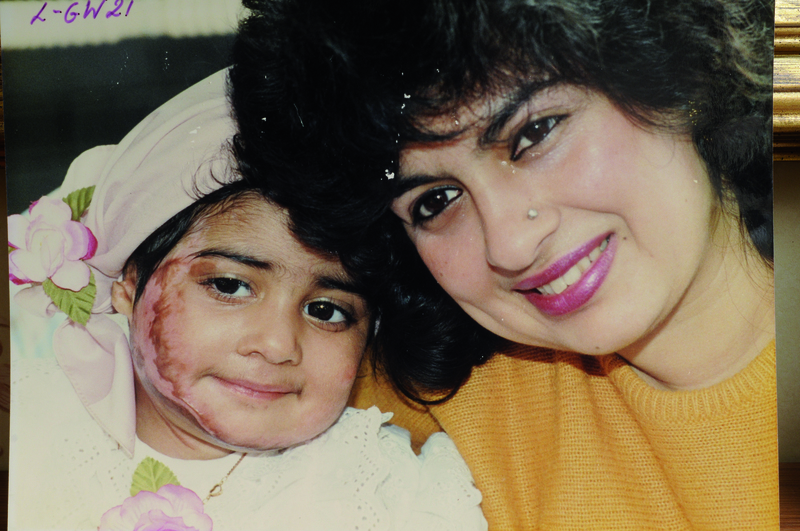 RAFT patron Ferrial Syed pictured with her Mum as a child after being discharged from Northwood Hospital, where she received pioneering treatment for third degree burns following an accident. Ferrial says that without RAFT’s life-saving research she wouldn’t be here today. We have published hundreds of medical papers, received numerous awards and have received recognition from the scientific community for our contributions to research. However, what is most important to us is the people we aim to support. Scientific research is the tool that we use to make people’s lives better.